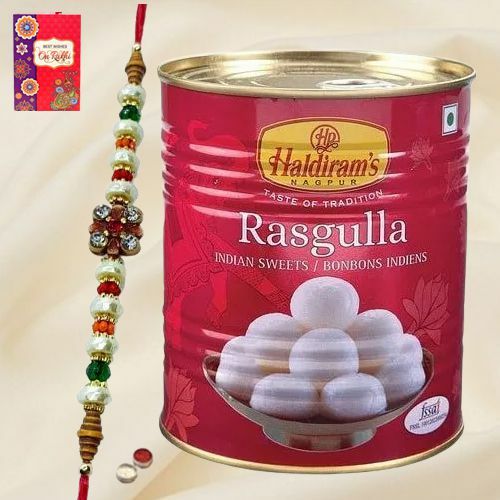 Splash liveliness into the life of the brother you care about by gifting this Haldiram Rasgulla Pack with Designer Rakhi that helps instantly rejuvenate the mood. This trendy Assortment is decked with 1 Pc Designer Rakhi, 1 Kg Tin Pack of Haldiram's Rasgulla along with Free Roli Tika and Chawal for a sweet endeavor. This elegant Combo is paired with 1/2 Kg Tin Pack of Haldirams Rasgulla,1 Pc Bhaiya Bhabhi Rakhi along with Free Roli Tika and Chawal. This elegant Combo is paired with 1/2 Kg Tin Pack of Haldirams Rasgulla, 1 Pc Family Rakhi Set along with Free Roli Tika and Chawal. 1 Kg Tin Pack of Haldirams Rasgulla, 1 Pc Designer Rakhi along with Free Roli Tika and Chawal.